What’s new in GPS Tracking v1.5? With the release of GPS Tracking v1.5, the downloads are off the charts. Version 1.5 comes equipped with a courtesy map of where you are, plus you can now type up to 60 characters when sending your location to Twitter, which is a cool feature if you ask me. A couple other minor bug fixes were applied to make the GPS Tracking App a very solid choice. 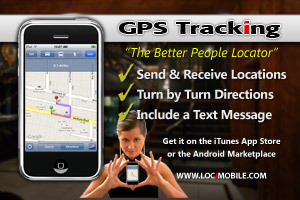 Check us out on iTunes Top 25 Social Networking Apps, or simply search for GPS Tracking in the iTunes App Store. Android users can now enjoy GPS Tracking too! Search for GPS Tracking in the Android Market. GPS Tracking is currently used by more than 225,000 users in 77 countries around the world. Download the full version or the free trial today.